The party’s over. We weren’t invited, but we’re welcome to gawk at the aftermath. Above Victoria Miro’s entrance, a flickering sign in curvy pink neon, ‘The Mirror’, repositions the gallery as a sleazy club. The illusion is meticulously extended inside, delivering abundant evidence that a good time was recently had. This black-walled, dimly lit space, with its corner dance floor and its shady silkscreen-on-aluminium images of pole-dancing naked men, at first appears stalled at a minute past closing. A melancholy, opiated pop song still plays, and the cleaners haven’t arrived yet, so beer and vodka bottles litter the room alongside dirty ashtrays, and—evidence of proper raucousness—a mirror-ball has crashed to the ground. There was, it turns out, a real ‘invitation only’ party here. The smaller gallery that’s been converted into an authentic-looking cloakroom was used; ditto the fake toilet, with its cubicles and, notably, its framed picture of a man on the little table by the tip tray, with a note reading, plangently, ‘1971-2008’. If we don’t know who he is/was, there’s plenty else we’re excluded from here. Up the black-walled stairs to the first floor, complicating the verisimilitude, are framed snapshots mostly from the men-only party: people smiling, a couple groping in the toilets and images of classical statues—the body in elegant historical equipoise, in stark contrast to the way it appears in the party shots. In so many ways, as the title of Elmgreen & Dragset’s exhibition clarifies, we are Too Late And even if we’d been there, we might have missed out. At the top of the stairs is a silver metal door: it says VIP on it, and it’s locked. The Berlin-based pair are adept at giving and withholding simultaneously, presenting constructs (a fake Prada store marooned in Texas desert, a scaled-down gallery space floating on black helium balloons in a room) that expend themselves, leaving you looking at a lack and realising that your presence in front of the shell-like work is all that’s activating it. In relation to this history, Too Late is complicated because it tangles up several approaches. On the one hand, it comes off as a nihilistic commentary on the collapse of art’s higher aspirations into a space of sheer, non-intellectual, libidinal entertainment; on the other, it stages a willful exclusion that speaks of, and for, a gay milieu. These aspects, alongside the inferences of mortality, mingle uneasily and imply an impasse. Here, essentially remaking (without credit) Tom Marioni’s proto-relational 1970 conceptual art piece ‘The Art of Drinking Beer With Friends Is The Highest Form of Art’, the artists seem critical of a decadent artistic moment—ours—yet at the same time they’re partying in the face of it and mixing up queer politics with an aesthetics of decline. At London’s venerable Old Vic theatre, just prior to the exhibition’s opening, the pair staged their playlet Drama Queens, scripted by Forced Entertainment’s Tim Etchells and basically an R-rated, arty, reflexive version of Night at the Museum . In a brisk 45 minutes, a handful of remote-controlled simulacrums of 20th century sculptures roll around the circular stage and chat, with personality clashes providing much of the dialogue’s spark. Alex Jennings’ Ulrich Rückriem stone column ‘Untitled [Granite]’, sweary and phallocentric and purist in a parodically Teutonic fashion, irritates Lesley Manville’s primly ventriloquised Barbara Hepworth sculpture (‘a hole’, the Rückriem snorts); she, in turn, eventually elopes with Joseph Fiennes’ rational, statement-issuing Sol LeWitt ‘Four Cubes’, while Jeremy Irons’ lachrymose, existentialist Giacometti ‘Walking Man’ strides alone and everyone pretty much hates Kevin Spacey’s relentlessly crass silver inflatable Jeff Koons ‘Rabbit’. The rabbit, campily demanding fun, eventually gets his wish when disco lights sweep the stage, music blares, and the sculptures jerkily cavort, before a Brillo Box crashes down onto it from the ceiling and, being a Warhol, says nothing, combining geometry and populism with alien ease. The rest of the dialogue explores the Beckettian notion of the sculptures being trapped there, forced to ‘perform’, to entertain. Here, in the notion of entertainment and the emphasis of the viewer’s selfconsciousness, is where Drama Queens links to the Victoria Miro show. Where once was seriousness, now art is simply this: a party; a cavalcade of laughs; an animatronic gag-fest. 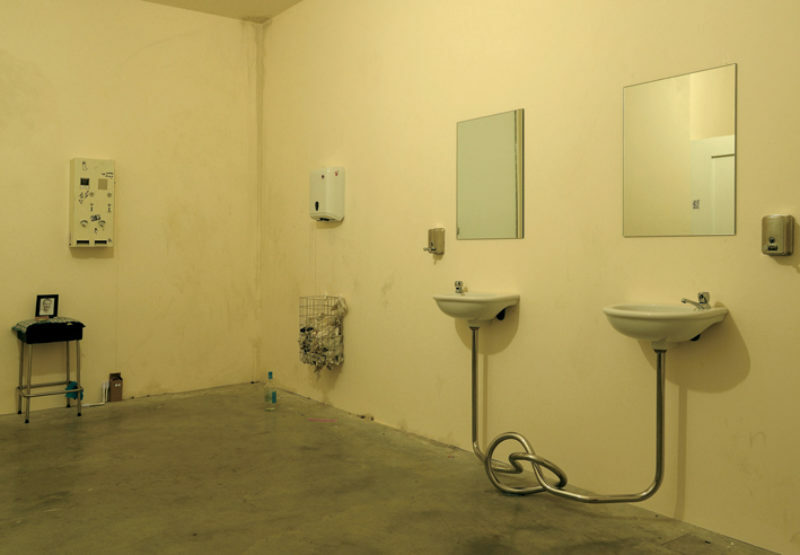 On the one hand, one might generously credit Elmgreen & Dragset for staring into the abyss so fixedly. At the same time, though, this viewer left both Too Late and Drama Queens feeling like he’d been offered a lot of scintillating surface, from zingy dialogue to fastidious environmental faking, only to have something essential—a reason to believe in art, a reason to get up in the morning—pickpocketed while he was distracted.